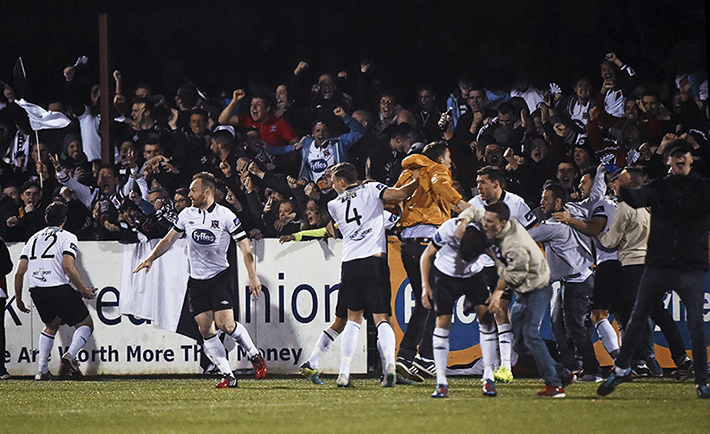 In October, Dundalk claimed the League of Ireland championship for the first time since 1995, their tenth championship overall, with a 2-0 defeat of Cork City at Oriel Park. Their captain Stephen O’Donnell, who had missed most of the season through injury, spoke to The College View about scoring the decisive goal for the Lilywhites that night. “I was playing a game against Shamrock Rovers and went in for a challenge and basically blew out my knee so I did the lateral ligaments and a whole lot of different damage so I was out for about five months. It was a bit of a dream comeback, especially against Cork who were our nearest rivals and it couldn’t have worked out any better,” said the DCU assistant manager. O’Donnell played for Shamrock Rovers in 2011 when they were defending champions and retained their crown, so the pressure of retaining the title is nothing new for him. When asked if Dundalk can repeat as champions, he said he doesn’t think motivation will be an issue. “You need to perform even better the second year because everyone’s out to beat you so you need to be even more motivated so that’s the challenge that we’re going to have but I think we have a good, young, hungry group of players so I don’t see motivation or that being the problem. The Galway native believes his club’s main contenders for the title this season will be Cork City, St. Patrick’s Athletic and Shamrock Rovers, two of which O’Donnell played for earlier in his career. Dundalk striker Pat Hoban was the League’s top goalscorer last season with twenty goals, which recently earned him a move to Oxford United, of England’s fourth tier. O’Donnell believes the loss of Hoban will be noticed but hopes it can be filled by spreading the goals around as opposed to relying on one player. “Pat scored twenty-something goals last year, he was the top scorer in the league so it’s obviously going to leave a big void but we’ve got Davy McMillan who’s got sixteen and most of those goals came off the bench so hopefully he can improve on that tally if he does start up front. The new incarnation of Galway United were promoted to the Premier Division after beating Shelbourne and UCD in the playoff semi-final and final respectively, and O’Donnell feels it’s a positive thing for the league to have another country club in the top-flight. “Galway is such a big city and such a sporting city so I think it’s crucial that they do have a representative in the Premier Division so hopefully the crowds get out to Terryland Park, or Éamon Deacy Park as it’s known now.